Although blackheads are a frustrating problem for many teens, blackheads aren't limited to the teen years. Preteen children can be plagued by blackheads, usually as a result of an increase in hormone levels, according to Oregon Health & Science University. If your 10-year-old is experiencing blackheads, treat his skin condition with methods appropriate for his age. Make an appointment with a dermatologist if your child's blackhead's don't improve, or if the blackheads are red or inflamed. A dermatologist will be able to prescribe age-appropriate medications for your 10-year-old. 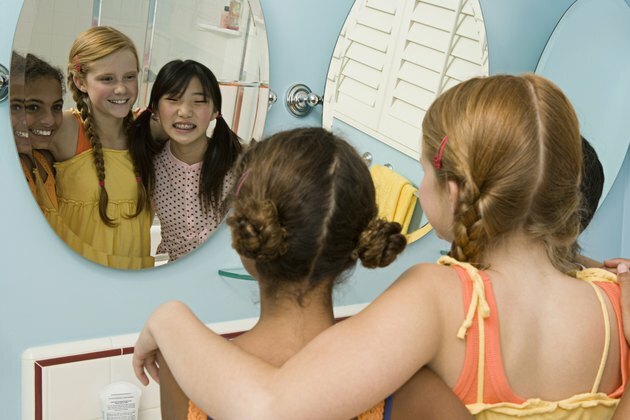 Help your 10-year-old wash her face twice daily with a gentle facial cleanser and warm water. Avoid hot water and cleansers containing soaps, fragrance or alcohol, which can irritate the skin and make the blackheads worse. Remind your child to dry her face by patting gently with a soft towel. Avoid rubbing, which can irritate the skin. Apply an over-the-counter lotion containing benzoyl peroxide, which will help to control bacteria that contribute to blackheads, or alpha hydroxy acid, which can dry up blemishes. Alternatively, dab blackheads with tea tree oil, suggests the University of Maryland Medical Center. Tea tree oil is gentle and will kill bacteria without the stinging, burning or itching that may be caused by benzoyl peroxide. Instruct your 10-year-old not to pinch or pop the blackheads. Attempting to eliminate blackheads in this manner can cause scarring. Teach your child the importance of keeping his hands away from his face. Tell him that his hands can transfer oil and bacteria to his face, which will make the blackheads worse. Remind your child to shampoo her hair regularly, especially if her hair is oily.